Are you searching for your next heavy duty sewing machine? How about Singer 4423? It is cheaper than normal sewing machines. However, it delivers the same or even better results than other sewing machines. It is a portable model which works great with heavy materials. You will enjoy sewing denim, leather and other thick fabrics with ease if you purchase this model. However, just like every other sewing machines, Singer 4423 has both benefits and flaws. Let’s jump into the review and reveal everything you need to know before you buy it. Why Singer 4423 Among Other Models? How Loud is Singer 4423? Where Can I Buy It? What is The Price? Let’s start with the fact that you will buy from a popular and trusted brand on the market. “Singer” has been one of the best sellers of consumer and artisan sewing machines on the market for years. It has been on the market since 1851. It is way older than other sewing machine companies. And it has a vibrant, amazing history we were surprised to learn about. Apparently, Singer was one of the first sewing companies in the world to produce the first portable machine. And that is not all. It was a computer-controlled machine. So, you cannot go wrong when buying from this brand. Also, the Singer 4423 is one of their best models. 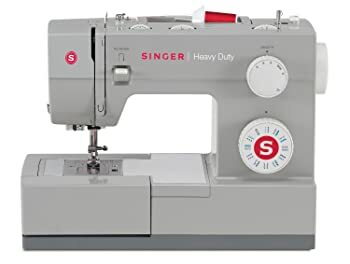 Designed to support heavy-duty stitching, Singer 4423 will make your every sewing dream come true. It looks like nothing can stand on the way of this workhorse. It can sew almost everything that you can think possibly of, including leather, canvas, and denim. You name it. Also, it has a stronger and more powerful motor than other sewing machines in the market. However, the best part is that even though it is a heavy duty sewing machine, it is not very heavy. It has medium weight, so you can easily move it around the home or your workplace. It weighs 14.5 pounds and measures 15.5 x 6.2 x 12 inches. Other heavy duty machines do not weight this much. They weight more. And they take more space. However, Singer 4423 is the dream come true of everyone. No matter if you are a newbie or a pro, you will love it. If you want to learn more about this model, keep on reading. We will reveal every feature of this nice sewing machine and provide a detailed explanation of each and every one of it. Singer 4423 can sew up to 1,100 stitches per minute. And for a mid-range sewing machine, you know this is a good number. It is super fast, unlike other sewing machines that can sew between 500 – 600 stitches per minute. Some models made for pros do not sew this quick. If you wonder what fabrics can Singer 4423 handle, we have mentioned this at the start. It can handle basically everything you throw at the table, starting from denim, corduroy, leather, vinyl, canvas and so much more. You can make your own vests and leather jackets. However, it does not work with heavy materials only. It is perfectly functional with thin, delicate materials as well. It will produce quality stitches that will make you proud of your crafts. Do not worry if you want to finish projects involving stretchy lycra, satin, rayon or silk. Singer 4423 will help you out and make sure that you are satisfied with the outcome. Quick tip: Make sure you pick the right needle when sewing a thicker material because no matter how powerful a sewing machine can be if you choose the wrong needle, it might not function properly. So, pay attention to the thickness of the needle as well. And remember that if you are only sewing the thickest material, this might not be the best model for you. If you want to sew one layer of plastic and two layers of canvas, Singer 4423 will not offer the most satisfying results. And let’s not forget that it is a home sewing machine after all. If you were wondering the number of stitches, Singer 4423 comes with 23 stitches which is more than enough for beginners. You will get it with 6 basic stitches, 2 stretch stitches, 12 decorative stitches, and 1 buttonhole. If you need more, consider buying a Singer 4432. Yes, the stitches are adjustable. This an important feature to look out for when buying a sewing machine. The longer stitches match thicker materials. And the shorter suit lighter and thinner ones. The length begins at 0.5 and offers 4 settings up to the width of 4mm. And the width begins at 0 through 6 settings to the largest width of 6mm. When you can adjust the length, you are free to create different effects which are absolutely incredible and important for creative crafters. Singer 4423 gives you complete freedom over sewing. It is natural to wonder if the machine you are buying is easy to use or not. Most brands say that their products are easy to use, when in fact, they are not. However, it is not that way with this brand. Singer 4423 is user-friendly and easy to work with, especially for newbies. Still, if you get caught up in difficulties, you can always check out YouTube videos. Also, it comes with a manual, so you can follow detailed instructions and easily set up your machine. As you can notice, Singer 4423 is feature-rich. However, most importantly, they are all modern features in order to provide a smooth sewing experience and best ending results. Most people wonder about the sensitivity of the foot speed control of Singer 4423 and other heavy-duty sewing machines. According to our research, we have found out that it does not take much pressure to produce a high speed with the Singer 4423 sewing model. If you wonder if the presser foot is flexible to use, the answer is, yes. And in 2 different ways. First, you can raise it for multi-layered or thicker materials. Or leave it in a normal position for different, lighter materials. Second, it comes pre-set, so adjusting it for thin or thick fabric weight is not necessary. It is ideal for newbies who are learning how to sew. However, advanced sewers can adjust the pressure. And it is not hard at all. Just insert a coin to turn the pressure adjusting screw and you are good to go. It is ideal for pros too. If you were wondering if the thread tension is adjustable, the answer is, yes, it is. You can adjust the tension in order to gain the best stitch quality for your material. Meaning, you control the upper thread tension and you do not have to worry if the lower one is set right. Singer 4423 has 4 different feet types, including zipper foot, buttonhole foot, all-purpose foot, and a button sewing foot. As you can notice, they are the standard types of feet you get with almost every sewing machine. It takes a single automatic step to create the perfect buttonholes. If you want to create something out of the ordinary and finish more complex crafts, you will have to purchase 9 other feet, including blind hem, cording, satin stitch, quilting/straight stitch, overcasting, gathering, even feed or darning/embroidery. Check out the presser feet page for details. Every sewing machine makes noise, right? Heavy-duty sewing machines, especially. Still, if you give Singer 4423 a chance, you will enjoy great sewing without a loud noise. According to our research and the Singer 4423 reviews online, no one is complaining about the noise. And if you want to know if the light is bright enough, the answer is, yes. Singer 4423 has a built-in LED which provides all the light you need for finishing larger and detailed projects. The company offers a 25-year limited warranty on the Singer 4423. However, there are important details you should pay attention to. For example, the warranty of the electronic components, light assembly, speed control, switches, motors, and wiring is only 2 years. The sewing machine head is covered for 25 years, while rings, attachments, belts, bulbs or other adjustments have 90 days of warranty. Keep in mind that if you encounter a factory defect, you can get free parts and labor in the next 90 days after the date of purchase. If you want to purchase a secondhand Singer 4423, we do not recommend this option since the original warranty is not valid. We suggest you buy a new one since it is very affordable. Just like every product on the market, this one has pros and cons. And if you want to learn more about the benefits and disadvantages of Singer 4423, stick with us and keep reading. As we mentioned before, this is the intermediate model. Meaning, you should not expect that extra stretch and countless decorative stitches. In order to get that, you will have to pay more and choose an advanced model. Also, keep in mind that the defective warranty is 90 days only. Make sure you test your machine during that period to check the endurance. Singer 4423 is a manual model. Meaning, there is no automatic stop when you are making a buttonhole, which is one more disadvantage to the list of cons. However, with extra care, you can avoid balling up the thread. It is not perfect but you get a good deal for the price. When hesitating, just think of the many benefits such as quality stitches for various types of fabrics, starting from light to heavy duty. Also, think about the simple operation. If you are a beginner, you will not experience difficulties with it. Still, it is also suitable for pros. If you made up your mind and you want to purchase this model, you can find it at your local sewing specialty market. However, you can also check on Amazon and purchase it online. Only good words for Singer and their 4423 model. Although it has some disadvantages, the benefits you get overtop everything that is considered as negative about this model. It will allow you to sew heavy duty fabrics with ease and boost your sewing skills and creativity. We recommend Singer 4423 because we concluded that it is a great deal for the price and offers quality performance. It is time that someone praises this under-estimated machine and seizes the opportunity. Will that someone be you? If so, we will be happy to hear about your experience with Singer 4423 and learn what you have to say about it from firsthand.